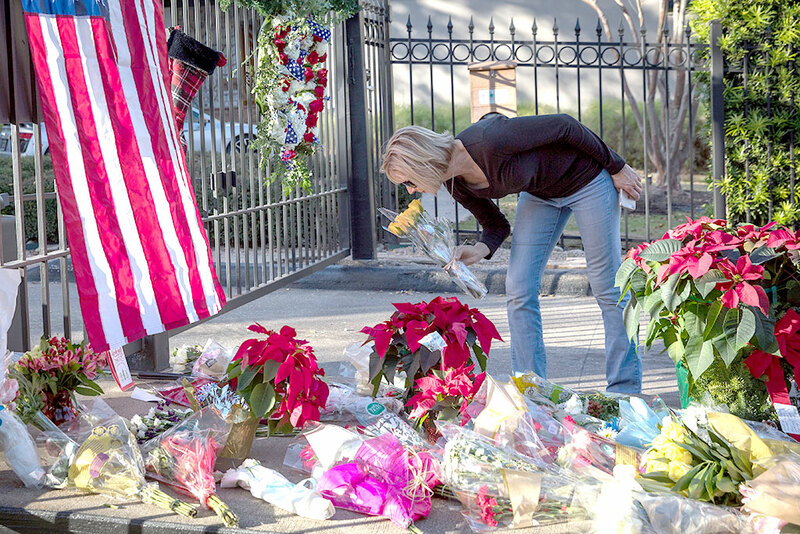 A mourner leaves flowers at a makeshift memorial in tribute to former US President George H. W. Bush outside a gated community where Bush lived in Houston, Texas, on December 2, 2018. – To commemorate the first former president to die since Gerald Ford in 2006, officials have announced a detailed, four-day schedule of celebratory services and tribute, organized with military precision by the Pentagon task force charged with protecting the US capital. The 41st president died on November 30, 2018, aged 94, at his home in Texas. lags flew at half-staff across the United States on Saturday as Americans prepared for a week of solemn tributes to George H.W. Bush, in his home state of Texas and in the US Capitol, a day after the former president died at age 94. Tributes poured in from world leaders in memory of the 41st US president, who guided America through the end of the Cold War and launched the international campaign to drive Iraqi strongman Saddam Hussein’s forces from Kuwait. Many of those same leaders are expected to attend Bush’s state funeral next week, alongside President Donald Trump and his wife Melania. Trump was notably absent from the funerals of the statesman’s late wife Barbara, and of veteran fellow Republican John McCain. “His accomplishments were great from beginning to end,” Trump tweeted. Declaring a national day of mourning for December 5 — when the federal government and New York Stock Exchange will close in Bush’s honor — Trump also signaled his respect by calling off a press conference planned at the G20 summit in Buenos Aires. Bush’s remains will travel back to Texas on Wednesday, where he will lie in repose at St Martin’s Episcopal Church in Houston with a funeral service the next day preceding his interment at the George Bush Presidential Library in College Station. He will make his final journey aboard a funeral train. At the presidential library on Saturday, people came to sign the memorial book in Bush’s honor, or lay flowers at the feet of his statue. Bush was a decorated World War II pilot, diplomat and onetime CIA chief who saw his son George follow in his footsteps to the Oval Office — making them only the second father-son duo in American presidential history, after John and John Quincy Adams. Britain took the rare step of lowering flags in government buildings. Suffering from Parkinson’s disease, Bush had been wheelchair-bound and in failing health. He is survived by his five living children and 17 grandchildren. Former secretary of state James Baker recounted anecdotes from his longtime friend’s final days to The New York Times. He said Bush’s last words were to the younger George, who was put on the speaker phone to say goodbye, saying he had been a “wonderful dad” and that he loved him. Born on June 12, 1924 in Milton, Massachusetts into a wealthy political dynasty, Bush left school to join the US Navy during World War II. He was rescued at sea after being shot down over the Pacific. After graduating from Yale University, he briefly worked in the Texas oil industry. He served in the US House of Representatives, as Washington’s envoy to China and as chief of the Central Intelligence Agency before becoming Ronald Reagan’s vice president. He declared a “new world order” in 1990 and — backed by a 32-nation coalition — drove Iraq from Kuwait with a lightning air and ground assault.